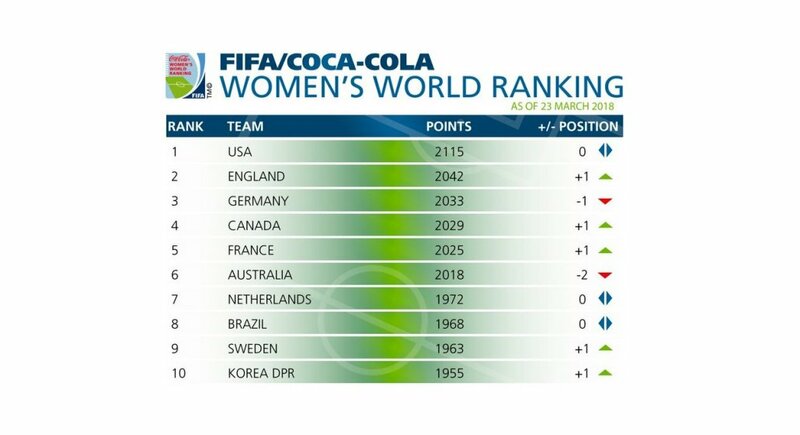 The new FIFA/Coca-Cola Women’s World Rankings see England in their highest ever position of second, while USA still lead after their SheBelieves Cup success. In finishing runners-up, and earning nine points during this period, England moved into the top two in the ranking for the first time. Germany’s disappointing showing sees them fall out of the top two for the first time since June 2009, with the Olympic champions having lost 19 points and dropped to an all-time low of 2,033. The Netherlands (7th, unchanged) and Sweden (9th, up 1) are now in the top ten after sharing this year’s Algarve Cup title. The Swedes have moved up at the expense of Japan (11th, down 2), who have dropped out of the top ten for the first time since December 2007, while North Korea climb to tenth. Just behind the Japanese are Spain (12th, up 1), who are now in their highest-ever position after claiming this year’s Cyprus Cup title. After gaining 32 points this period, Portugal (36th, up 2) are the most improved team over the past three months. Scotland are up one to 22nd, Republic of Ireland remain 29th, Wales move up to 34th and Northern Ireland drop one place to 56th. Six teams have re-entered the ranking: namely, the South American duo of Paraguay (50th) and Uruguay (68th), and four African sides in the shape of Côte d’Ivoire (65th), Morocco (73rd), Senegal (79th) and Burkina Faso (97th). Seven teams – El Salvador, Ethiopia, Nicaragua, FYR Macedonia, Tanzania, Rwanda and Uganda – are no longer in the ranking due to prolonged inactivity. The next FIFA/Coca-Cola Women’s World Ranking will be published on 22 June 2018.